Test days are obviously a busy time for the Morpheus team. This blog is to give all of you some insight into who the players are. In a future blog we’ll bring you a narrative of a test day. Who makes up the team and what their roles & responsibility are on the day of a test. Flight Manager (FM) – The Flight Manager has overall responsibility of the test. This is the position that represents project management, usually either the Project or Deputy Project manager. The FM coordinates any external interfaces needed on test day. They monitor the day’s activities and give the final Go/No-Go for the test. Test Conductor (TC) – This position is in charge of all the test day operations. The TC focuses on overall vehicle and crew safety, while integrating operations between the various control disciplines and the pad crew. TC also performs all the voice communications between the control center and pad crew. The position can be likened to the Flight Director in the Shuttle or Station mission control room. Operator – Assists TC in the day’s operations, and helps ensure all steps are completed as required in the test procedures. The Operator sends all commands to the vehicle leading up to and including the start of the ignition sequence. The Operator also develops the day of flight procedures used by the team. Range Safety Officer (RSO) – Staffed by a member of the test safety group from JSC, the RSO has ultimate responsibility that Morpheus stays inside the range boundaries defined at KSC. Should the RSO feel the vehicle poses a threat to any personnel they have the ability to terminate the flight via the independent Thrust Termination System (TTS). The RSO has the authority to terminate the test independent of the operations team at any point they deem necessary. Test Area Manager (TAM) – The TAM is Morpheus’ liaison to KSC. On test days the TAM clears the SLF air space, and coordinates with the NASA Air Traffic Control tower. The TAM also coordinates other KSC operations, such as crane riggers and truck operators for the cryogenic tankers. Guidance, Navigation, & Control (GNC) – The GNC console is in charge of designing the day’s trajectory as well as the sensors such as GPS and Inertial Measurement Units (IMU) that keep the vehicle headed in the right direction. The trajectory is developed several days ahead of time so that many simulations can verify the correct parameters are set on the day of flight. On the day of flight the GNC makes final tweaks to the plan to account for test day variability like the actual prop load and the winds of the day. The GNC console must also monitor the GNC sensors for anomalous behavior and to ensure they are properly initialized prior to flight. Propulsion (Prop) – The Prop console is responsible for all components related to the propulsion systems of Morpheus. This includes propellant tanks, main engine, Reaction Control System (RCS), and feed systems. Based on the trajectory design of the day the Prop console will calculate the propellant load of Liquid Oxygen (LOX) and Liquid Methane. Their calculations have to include main engine run-time, boil-off, and reserve. During the flight Prop monitors the main engine and RCS thrusters for correct performance. Avionics and Power Systems (APS) – APS monitors the flight computer and power systems. Morpheus has flight battery system that must be verified prior to flight. There are a number of electrical systems that must be monitored throughout the day to ensure a successful flight. Ground Data Systems (GDS) – The control center has multiple workstations the operators use for command and telemetry and these are maintained by the GDS. GDS is staffed by the Flight Software (FSW) group and are in charge of both the ground systems software and the on-board flight software. 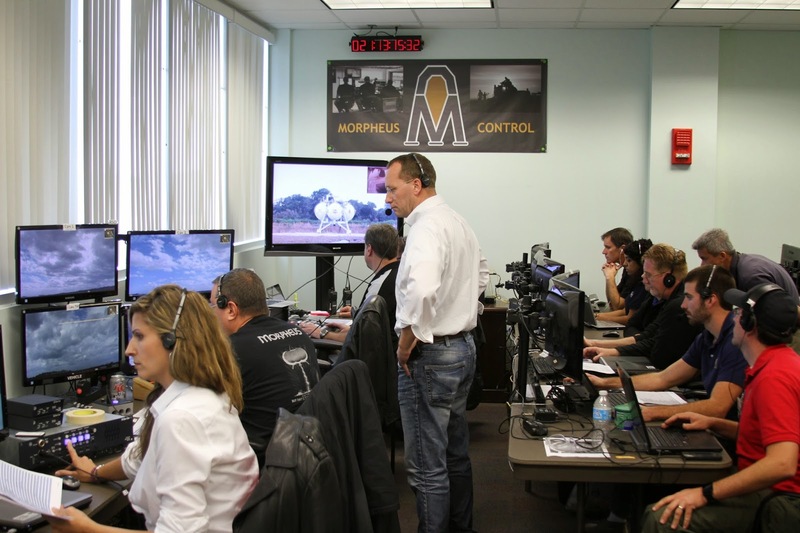 Morpheus Comm – These folks are responsible for the command and telemetry radios that relay Morpheus data back to the control center, along with the infrastructure that goes along with it. They also set up many of the cameras that are used for situational awareness inside the control center, as well as streamed out to our live audience. Pad Crew: There are a number of Pad Crew that prepare the vehicle for test flight. PAD 1 – PAD 1 coordinates all pad activity. Throughout the day the vehicle is put through functional checks, filled with propellants, leak checked, and put into final preparations. There are a number of personnel that help accomplish these tasks, including crane riggers, cryo operators, and other Morpheus personnel. PAD 2 – Morpheus personnel who assist with propellant loading and leak checks. PAD 3 – This position operates all the cryogenic tankers for propellant loading. Structures – The structures representative assists the pad crew with items that fall under their responsibility, such as launch stands and tether configurations.